When Bethesda first announced Fallout 76 at E3 2018, there was a mixed response from fans. We had a feeling a Fallout game was in the works, but it wasn’t the core game many had hoped for, and instead Bethesda boss Todd Howard unveiled an online multiplayer version of the iconic wasteland. Fallout 76 begins with you awakening in Vault 76 on Reclamation Day, the holiday when vault inhabitants celebrate surviving the nuclear apocalypse and finally get the chance to leave their metal home. After designing my survivor in character creation, I gradually work my way through the vault towards the outside world, exploring every nook and cranny of the vault that I can before being forced into the sunlight. It becomes clear the Reclamation Day party is long over, the only remnants are old party hats, deflated balloons and crumpled confetti - you’re completely alone. The route to the exit is lined with a selection of helpful items which you need in the wasteland - a Pip-Boy, some food, Radaway, Stimpacks and the new C.A.M.P. settlement system. On-screen prompts briefly explain how the new settlement system works as well as the importance of keeping radiation low and your hunger and thirst bar high - though it’s hard to find radiation-free subsistence in a fallout. In addition, there’s a new SPECIAL Perk System which awards you a point to increase your SPECIAL stats (strength, endurance, intelligence etc) each time you level up. When you add a point to a SPECIAL stat, you can also pick Perk Cards which give you certain buffs or abilities. Each of these SPECIAL stats has cards associated with it, however the cards you get to pick from are not always associated with the SPECIAL you just increased. After reaching level one, I upgraded my Strength and chose to pick the Gladiator card (which improves melee damage). Essentially this allows you to create a loadout of skills and specialize in particular areas. Perk Cards can be added on top of each other, discarded, swapped or traded with other players. As I near the vault door, the sight of a Mr Handy (this one is named Alderton) is a pleasant surprise - a familiar metallic friend in a brand new world. He’s potentially the last friendly robotic face I will see - I take my first steps into the wasteland of West Virginia-inspired Appalachia. Stepping into the wasteland feels like home - a desolate, radiation-ravaged home that I forgot I longed for. Mutated beavers roam the rivers, three-headed opossums hide in the singed grass, and six-legged Radstag bask in the rocky hills. It’s a beautiful nightmare. But what becomes quickly apparent is the lack of NPCs - the kooky characters with peculiar backstories which made the world of Fallout feel like its own entity. Rather than NPCs, you have the various Mr Handy’s dotted around wasteland as guides, and - of course - the other players. I knew Fallout 76 was an online multiplayer game but somehow I had blocked this fact (and the other figures on the map) from my brain. Until this point everything seemed pretty much the same as the other Fallout titles, if not a little less guided. It’s only when undertaking a mission to find the Vault Overseer’s camp that this illusion was shattered. As I crafted myself some new armor from an irradiated beaver I had encountered, I heard rummaging from beyond the crafting screen. Quickly exiting, and expecting to see a rabid dog or ravaged ghoul, I was somewhat taken aback to see another player. They did nothing except stand and stare at me - BigRed69, an intruder in my silent world with a desire to chase opossums in my direction. I put on Appalachia radio and fled, hoping to lose my new ‘friend’ to the grasp of a radiated beast. My new personal mission becomes gathering knickknacks for the base I intend to build when I get to grips with the C.A.M.P. system. A gnome here, a pool ball there - this is the monotony I missed, exploring the abandoned homes of the dead and humming along to vintage tunes on the radio. And I know these tracks, since many were featured in Fallout 4 - Atom Bomb Baby by The Five Stars and Crazy He Calls Me by Billie Holiday. It’s a staunch reminder that Fallout 76 seems to be in the shadow of the games which came before it, an empty shell. The closest comparison I can think of is having to buy store-brand cola because they’re all out of Coca-Cola - you’ll drink it if you must, but there’s no escaping the disappointment. 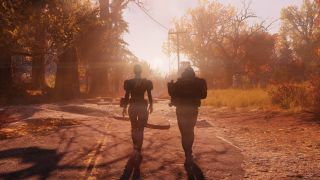 We played a considerable amount of Fallout 76 and found it didn't improve drastically. While playing with friends can improve the experience, it remains lacklustre and the novelty soon wears off. Fallout 76 offers is an empty shell of a Fallout game, lacking the personality and story which drives the series.